When starting afresh, think of the space with no units and consider all the possible places that the units might be placed. This is the blank canvas for your kitchen design. Consider also those solutions which you think won’t work! 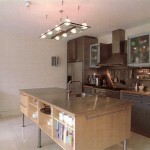 You might be surprised, or perhaps you might gain a new insight into the possibilities for the kitchen design. Don’t assume that the sink has to remain in its traditional position at a window. I am always interested in exploring at least one option which entails keeping the units away from the windows. This has the effect of making the space seem bigger and of allowing the light to flow. The space can seem “entrapped” when windows are blocked by units, even low level units. Keeping the windows free from units can also improve the relationship between the room and the garden, an ever-increasing priority nowadays. Don’t follow slavishly the traditional advice that the sink, cooker and fridge should form a triangle. Ours’ are in a straight line – sink and fridge either side of a range cooker – which works well functionally, aesthetically and spatially. Try to avoid corners, where possible. While improvements have been made in the design of corner cupboards, they are not optimal. 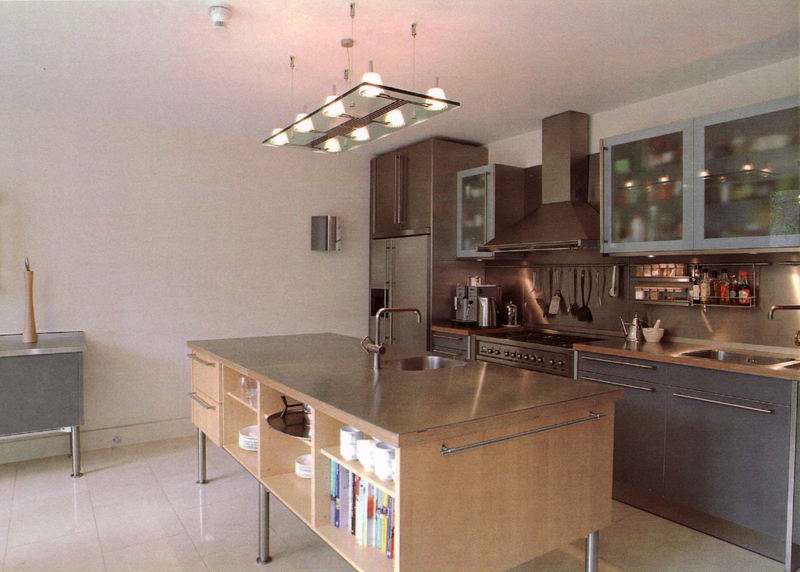 Keep taller units – fridge, larder, eye level oven etc – away from windows so as to minimise their impact on the light. 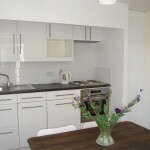 Consider making the units full height, that is, up to the ceiling, especially where space is limited. This upper level cupboard space is always useful for those things not in everyday use. Provide drawers, not cupboards, to all low level units. Scrambling to reach things at the back of cupboards is no longer necessary! Consider also a dishwasher with drawers as opposed to a pull down door. 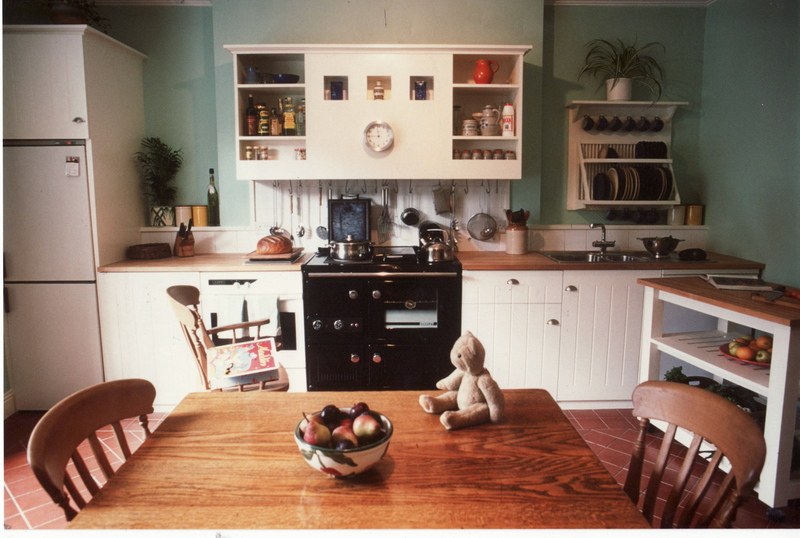 Provide adjustable shelving to all cupboards where possible and especially where the kitchen size is restricted. This will allow for optimal use of the storage space available. Provide an inline fan to the extractor system where possible. This entails locating the fan remotely from the point of extract, thereby minimising noise when the fan is in use. Less noise means you will be more inclined to use the fan with a resulting reduction in smells and condensation. Give thought to managing waster disposal and recycling. Nowadays, we need 3 part bins, one section each for brown, black and green bins. Be wary of the desire to provide an island unit at all costs! I think islands are suited well to some spaces and room configurations but not all. For example, an island would fit easily in our kitchen but would undoubtedly destroy the overall balance of space and make the kitchen more dominant in the house than we wish. 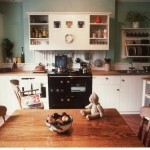 On the same note, bear in mind the extent of your kitchen units relative to your overall space. For example, our kitchen storage capacity is geared towards a weekly shop, not towards 6 month’s survival rations and an encyclopaedic larder. Small kitchens require extra attention, with space at an obvious premium. Consider if the washing machine can be accommodated elsewhere to free up valuable space. Possible alternative locations include under the stairs or in the bathroom. 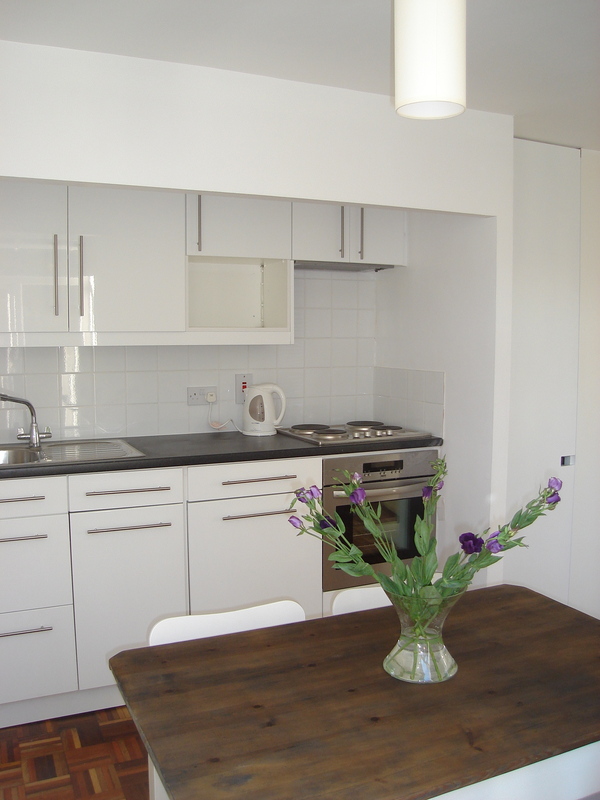 A straight run of units at lower level measures 5.8m in length with, from left to right, mobile bin, dishwasher, sink preparation area, range cooker, second preparation area, American fridge. Custom made cupboards at the upper level are of birch ply. The sink and preparation area are freestanding pieces from the system 20 range from bulthaup. This is a flexible, mobile, universally useable system that can be extended as much as you wish and which is designed to move house with you. Each of the two pieces measures 130cm x 70cm x 95cm high. The sink element is so well designed that it is the only area we use – and need – for food preparation with the table providing useful back-up when necessary. It is an essay in intelligent, ergonomic design. The large stainless steel sink has two flat draining areas either side and comes with a suite of sliding chopping boards and multi-functional sink inset pieces. The bulthaup bin is similarly thoughtfully designed, with a hinged flip up lid revealing 3 removeable caddy insets. A large drawer below is useful for larger items awaiting recycling like newspapers and cereal boxes. We didn’t provide an inline fan! The fixed tap does not reach the farthest reaches of the large sink, a detachable, flexible nozzle would solve this issue. We will probably need to accommodate a microwave for the teenage phase and a few minor tweaks to make the kitchen more teenage friendly.